» A Movie Review by Walter Albert: THE TURMOIL (1924). A Movie Review by Walter Albert: THE TURMOIL (1924). THE TURMOIL. Universal-Jewel, 1924. Emmett Corrigan, George Hackathorne, Edward Hearn, Theodore von Fitz, Eileen Percy, Pauline Garon, Eleanor Boardman, Winter Hall. 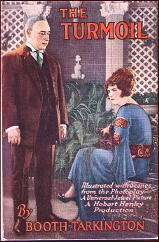 Based on the novel (1915) by Booth Tarkington. Director: Hobart Henley. Shown at Cinecon 39, Hollywood CA, Aug-Sept 2003. It’s probably difficult to appreciate the appeal Booth Tarkington had for earlier generations (which include mine). He’s probably best remembered as the novelist who provided the inspiration for Welles’ Magnificent Ambersons, but even earlier I read and reread his Penrod series, the story of an imaginative, adventuresome boy who did all the things that I, a dull, unimaginative, tradition-bound kid, never dared to do. The Turmoil, however, is more in the vein of the Ambersons and is the story of a successful father who tries to direct the lives of his three sons, with disastrous results for two of them. It’s a dark film that lacks the kind of riveting detail that a William deMille might have brought to it, but somehow manages to focus poignantly on the difficult road to manhood travelled by the third son, with a particularly fine performance by Eleanor Boardman as the young woman whose love he eventually returns. NOTE: The cover shown is that of the Grosset & Dunlap “Photoplay” edition, 1924. This review is just about right, and by that I mean, it makes me want to go hunt up a copy. Preferably the Grosset & Dunlop photoplay edition. I see a decent copy of the photoplay edition on ABE for $15, complete with jacket, if it’s the book you’re after. I haven’t been able to find any copies of the movie on DVD, but I haven’t been looking all that hard. Booth Tarkington, who wrote the novel, is, as Walter suggests, not very well known today, surprisingly so for a man who won two Pulitzer Prizes for his fiction, AMBERSONS and ALICE ADAMS. According to Wikipedia, only he, William Faulkner and John Updike ever won more than once. Only another example of how quickly fame and reputation can flitter away. Good deal, Steve. I will look for it. I have seen copies for much, much more. There is someone I work with re collectible books, so if one approach doesn’t work, another very likely will.